But first, I’d love to share my inspiring interview of Joyce Sweeney, so you can have a glimpse into the heart and mind of the woman who helped thirty-six writers become published. One of the things I noticed soon after meeting Joyce was how much she cares about all of her students. She’s the first one to cheer for your great news, give you a shoulder to cry on, send a sprinkle of fairy dust your way when you’re about to send out a new sub or a requested revision, and help you through pretty much anything this business throws your way. She’s like our proud Mama, and I know I’ve said this a million times, but I feel incredibly lucky to have Joyce in my life! 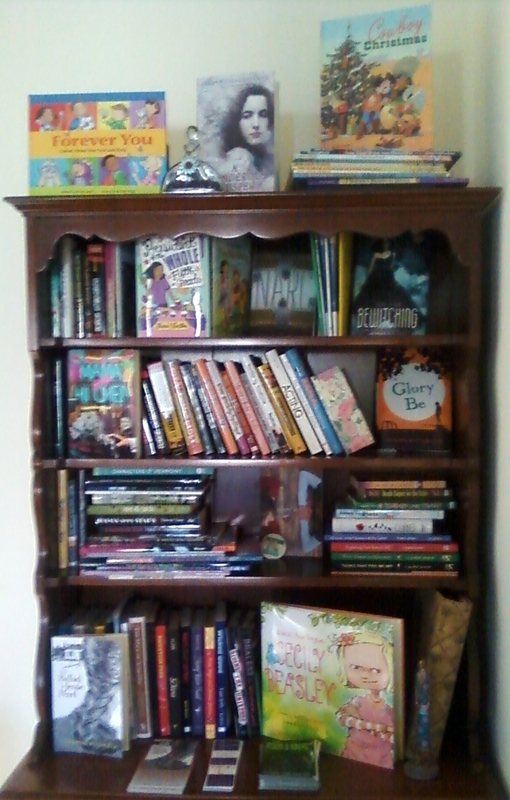 Here’s a picture of Joyce’s bookshelf, where she proudly displays the books her students have had published. Welcome to my blog, Joyce! Can you share how you became a writing coach, and what you love most about it? What do you think is the most challenging part of being a writing coach? I started out years ago teaching five-week classes through the Broward County Library, just as a way to make extra money. I soon found out I had a passion for teaching and mentoring and the expansion began! I started my own ongoing workshop on Thursdays in 1994 and my goal was to have one of my writers get published. That happened in 1996. By 1998, we had seven people with books accepted and the Magic Bean ceremony was born. Then I expanded to two classes a week, then three. All this is fed by SCBWI, where I meet new writers all the time and I’ve always done manuscript critiques for people all over the country, but that has hugely expanded in the past few years as well. I just can’t stop myself. When I see a writer who needs a helping hand, I have to jump in! What I love most is when my students have their books accepted, seeing that dream realized and knowing what it means to them and how hard they’ve worked for it. The most challenging is when I know I’m right about something and the writer just doesn’t believe me…but of course, the coach can’t insist, she can only coach. How did you come up with the idea to create video classes? People have been asking me to do online classes for a long time because I have so many clients outside of Florida and they want to take a class with me, too! Cathy Castelli made it easy by suggesting a way we could do it and I was very excited. Making the videos made me a little nervous…I’m used to talking to a room full of people, not a lens. But I got used to it after a while. I heard that your video course can help people at all stages in their writing careers. Can you give a few examples of the way it can help newer writers, those who have honed their craft for years and are currently seeking agents and editors, and published and agented authors? For a beginner, this lets you get a good grounding of the fundamentals so you can start out right and avoid a lot of mistakes. And for the more experienced, and even published writers…let’s face it, we never stop learning. I’ve made a real study of craft over the past decade and I have a lot of shortcuts and ideas I don’t see anywhere else. I noticed that Cathy, even though she works with me in a weekly group, learned a lot from the classes. So this is definitely good for you at any level. Do you need to have a completed novel to take your course? No, the lessons are about the elements of craft, so you can learn them before you write, while you’re writing or after you have a draft completed. Wherever you’re jumping in, your writing will definitely become stronger and you’ll have more confidence that you know how to get the best out of yourself. How many hours per week do you think the average writer will spend on your class? That’s hard to say. To simply view a lesson takes about thirty minutes. Probably some people will want to view them several times, to let the ideas absorb or take notes, or copy the handouts. Then if you are applying the principles to your WIP, that’s as many hours as you want to do. Plus there’s the website where you can share homework or talk to the other participants. So it’s really up to those taking the class how much time they’d like to spend. What makes this different from other classes out there? I hear all the time that I’m teaching some things that are not out there. My method of skills assessment, which comes in Lesson One, I know is unique, because I developed it and it gives writers a great sense of how and where to improve…and also why even though they are very advanced, there might be one aspect of craft they need to work on more. There are lots of plot templates out there but the one I developed over the past few years along with Jamie Morris works really well. As a novelist, I developed a lot of my own tricks and ideas about character, description etc. I think I’m in a unique position for marketing because I’ve mentored so many writers to success. So just because of my personal experience, there’s a lot of good information in these classes. Can you explain a little more about how the forum will work? Students can use the forum any way they want to…there are homework assignments, which they can share on the forum if they want…or they can ask me a question, or they can just chat with each other about the classes. I’ll be checking in often to see what’s going on and help people get the most from each lesson. Will this course benefit nonfiction or picture book writers? I think this course works very well for memoir writers because I address memoir in the lessons and I feel fiction writing techniques help them shape their material, which can sometimes be unwieldy. I reference picture books at times, and most of the elements of craft apply to picture books as well as novels…great characters, realistic dialog, etc. Some things will not apply to them…for example most PB’s don’t need to worry about subplots….but there would be a lot of value to all writers in this course, I think. Will participants receive critiques during this class? There are very short homework assignments. Not always writing, sometimes it’s a way of looking back at your WIP with something, like the Plot Clock, in mind. But if anyone posts something short on the forum, I’ll comment on it for sure. But not formal critiques per se. You've helped so many writers become published. What advice would you give writers who keep coming close to getting an agent or editor, but haven't received that magical ‘yes’ yet? Please, please believe me when I tell you it takes longer than you think. If you’re coming close, as in getting requests, you’re moving down the chess board. There are certain steps to publication and without exception, if you take each step you need to take, you get there. But the steps do include revising more than you’d expect, learning more about your craft even when you think you’ve learned ‘everything’ and not letting rejections stop you. I see the same kind of determination in all my writers who make it. They just keep going no matter what the obstacles are…and one magical day…all the doors fly open. It happens every time. Except to the ones who give up…. Thanks again for visiting my blog, Joyce! And congratulations on the launch of your online class. Fiction Writing Essentials is a ten-session class for writers of all levels. In this class, you’ll learn about everything from pre-book decisions to marketing. Each session will include a video lecture, handouts, and assignments. Students will also have access to a forum where they can interact with each other, share assignments, and ask questions. Joyce has critiqued over a thousand manuscripts during the past 20 years, and will share one writing tip a day on her Sweeney Writing Coach website until class starts. She’ll also continue to share the types of mistakes she often sees in manuscripts and how to avoid them in her free monthly newsletter. A 50 page novel critique! Three picture book critiques and one query critique! --Several of these are listed under the Invent Your Own Option buttons--click on them for more info! The lucky winners will be announced on Sunday. Good luck! Thanks for letting us know about the contest, Mindy! I'm definitely entering... and keeping my fingers crossed!